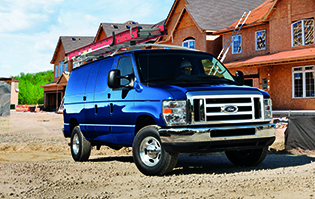 Properly equipped, the E-350 and E-450 can tow up to 10,000 lbs. 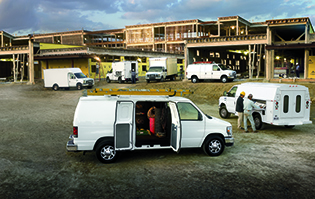 With innovative technologies – such as the available integrated trailer brake controller and available electronic message center, you’ll not only have one hardworking van, but one that works smart too. The standard 5.4L Triton® V8 engine features flex-fuel capability, meaning it can run on unleaded gasoline, E85 (85 percent ethanol and 15 percent gasoline) or any mix of the two. The 5.4L Triton® and available 6.8L Triton® engines are also available with a CNG/Propane Gaseous Engine Prep Package that makes them capable of conversion to compressed natural gas or propane autogas. Featuring a muscular 305 horsepower and best-in-class 420 lb.-ft. of torque, the available 6.8L Triton® V10 is for big applications requiring lots of raw power. It’s coupled with the TorqShift® 6-speed automatic transmission, which includes a selectable tow/haul mode that compensates for altitude, grade and load conditions. 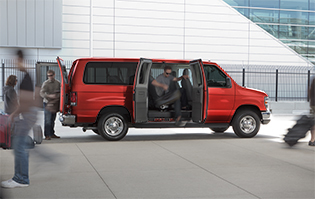 E-Series models are engineered with body-on-frame construction and equipped with safety features including front airbags* for the driver and front passenger plus four-wheel anti-lock brakes that help you maintain steering control when braking and coming to a straight stop.